Beginning life as a Death Metal outfit, Sentenced ventured into the risky world of experimentation (much like fellow countrymen Amorphis) and released two good "classic" metal albums in Amok and Down. Continuing on that road, they adopted a more Goth-rock sound on subsequent releases, finally bringing us to The Cold White Light - probably their most accessible album to date. While maintaining an overall somber mood and atmosphere that departs very little from their previous two releases, The Cold White Light is nonetheless quite varied in the delivery of Sentenced's trademark bleak emotions. "Excuse Me While I Kill Myself", "Neverlasting", and "Blood & Tears" are all similar in tempo and style: solid rockers with catchy choruses and memorable hooks built on Sami Kukkohovi's bass driving the mood home. The melodies come across as upbeat, with the growling bass giving just a hint of a sinister undertone, even as the songs dwell on the dark subject matter of death , hopelessness and suicide. "You Are The One" stands apart from the rest of the album as it is a song of hope, and in fact is a love song that is written quite well. The catchy hooks and, on occasion, crushing groove make this a highlight of the album. "Guilt And Regret" is an attempt at a dark power ballad, but unfortunately comes off as cheese. Ville Laihiala's voice is, on a majority of the album, a good fit for the depressed atmosphere created by the music. His vocal melodies are strong, and make up a big portion of the success of the album, but here it seems forced and out of place. Wrapping up the disc is "No One There", a very powerful tune that envelops you in a feeling of despair from start to finish. The keyboards lend just the right amount of atmosphere here, helping draw you in and making this my favorite track on the album - though I could do without the death-cries of loons blasting from my headphones. 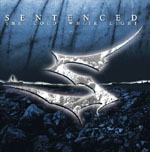 Fans of Sentenced will know what to expect from The Cold White Light, as no new direction is taken on this release. In fact, some may be disappointed by that fact though I think this is a solid work of rock. For those not familiar with the band, this album will not disappoint if you're partial to atmospheric Goth/Doom/Rock that is dark and melodic.